Move Toward Balance with Tulasara Facials! With a customized facial at Debony Salon, we do more than give TLC to your skin. We listen to you. To what your day is like, your habits and what you want to achieve most for your skin. The framework of the Debony Salon Facial service will always include a skin consultation, cleansing, toning, massage and protection. But we love to take it one step further and tailor your time in our salon with skin care that fits your unique complexion to a “T,” through AVEDA rituals and peels. 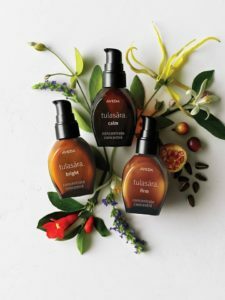 We’re excited about a new level of service with our facial offerings through our partnership with Aveda and its Tulasara facial treatments. Tulasara is Sanskrit for moving toward balance, and it’s with that mission in mind that our spa will be completely reborn with services and at-home skin care rituals and treatments that focus on balance, both in your skin and in your life. The Dual Exfoliation Peel is Aveda’s latest advancement in non-invasive, skin-renewing treatments. Using innovative techniques, this treatment combines Aveda’s naturally derived* mechanical and biochemical exfoliation methods into one powerful service that transforms and rejuvenates the skin through the process of dual exfoliation. The treatment delivers immediate, visible results in improved skin texture and radiance; smoothed appearance of fine, dry lines; and refined pores, revealing fresher, younger-looking skin. In a clinical study, the Dual Exfoliation Peel achieved better results than a combined microdermabrasion/30% glycolic peel treatment in both immediate smoothness and radiance, plus significantly better results in smoothness, radiance and the appearance of skin tone, one week later. Dry, oily, aging, uneven, sensitive and acneic skin conditions and eye concerns can all be addressed with a customized Tulasara ¯ ™ facial treatment. After a thorough consultation, your skin therapist will provide the best combination of products, personalized Aveda aromas and techniques and design a customized treatment that will move your skin toward balance and reveal its natural beauty. New concentrates accelerate skin’s restorative powers with highly concentrated, targeted treatments that firm, brighten or calm your skin. To use these treatments, you’ll layer the concentrates in the morning and evening, under your moisturizer. A daily ritual comprised of two steps, using the Ayurvedic practice of dry-brushing and applying Oleation oil. Step 1: Gentle dry-brushing with Aveda’s exfoliating brush of one minute, exfoliates skin and sloughs away dull and dry cells, revealing smoother skin. 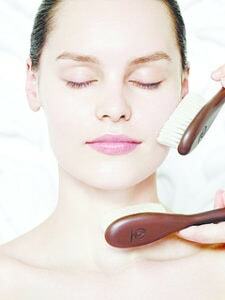 Step 2: A one minute facial follows, which awakens your skin and nourishes with the oleation oil. We’re so excited about these new services and products. Many of the girls in the salon have been integrating them into their own rituals and have been L-O-V-I-N-G the results. If you have any questions, we invite you to come into the salon and experience a treatment for yourself and/or ask any questions you may have about these new offerings. Throughout the month of September, we’re offering $20.00 off your first Dual Exfoliation Peel in celebration of Tulasara. Call the salon, today, to book your appointment. 603-383-9366.